Al Casey was a driving force in Phoenix's explosive 1950s rockabilly scene and, after relocating to Los Angeles in the 1960s, he became one of Hollywood's top-rank session musicians. As a guitar-for-hire, Casey played on the No. 1 smashes "Good Vibrations" by the Beach Boys (1966), "These Boots Are Made For Walking" by Nancy Sinatra (1966), "Strangers In The Night" by Frank Sinatra (1966), and "Somethin' Stupid" by Frank and Nancy (1967). Not to mention the Association's 1967 No. 2 hit "Never My Love" or Nilsson's No. 6 "Everybody's Talkin'" from the movie Midnight Cowboy. Or a slew of Monkees tracks. Casey also spent a few TV seasons playing in the studio band on Dean Martin's NBC variety show. But it was in Phoenix that Casey got his start. He later returned there and for years taught guitar lessons at Ziggie's Music, the landmark music store at 3309 N. Third Street. Casey was a prodigy on the pedal-steel guitar and as a teenager was impressive enough to join the Sunset Riders, Phoenix's premier country and western band. In the mid-1950s, the Sunset Riders were the house band for KRUX disc jockey Ray Odom's Arizona Hayride shows at Madison Square Garden in downtown Phoenix. The shows were broadcast live on radio station KRUX and for a time the group also appeared regularly on KOOL-TV (Channel 10). When Phoenix rock and roll was born, Al Casey was there. The young hotshot guitarist had an ear for the new sound. He played stand-up bass on "Dig That Ford" by Doug Harden and the Desert Suns, a local 1955 single that was one of the Valley's earliest stabs at rock. He contributed the Sun Records-influenced rockabilly guitar on the two-sided Phoenix classic "Cat Daddy" b/w "How About Me? - Pretty Pretty Baby?" by Jimmy Johnson and the Arizona Hayriders (who really were the Sunset Riders). But it was with his schoolmate Sanford Clark that Casey really helped make Phoenix music history in 1956. Clark's "The Fool" was the first true rock and roll hit recorded in the Valley. Casey contributed distinctive rockabilly guitar lick "The Fool". It was his reinterpretation of Chicago blues guitarist Hubert Sumlin's lead guitar line on Howlin' Wolf's "Smokestack Lightnin'". Casey had heard The Wolf's record on enigmatic Phoenix R'n'B disc jockey Mama's Little Boy Freddie's late-night show on Valley radio station KTYL. Clark's "The Fool" originally came out on the local label MCI, but Dot Records picked it up for national distribution. Arizona radio personality Lee Hazlewood wrote the song under the pseudonym Naomi Ford. Hazlewood would make a name for himself in the music business as a producer and songwriter, composing several other big hits, including "These Boots Are Made For Walking" for Nancy Sinatra, "Houston" for Dean Martin and "Not The Lovin' Kind" for Dino, Desi and Billy. "The Fool" debuted in Billboard on July 28, 1956 and, according to Joel Whitburn's Top Pop Singles 1955 to 1990 book, eventually got up to No. 7 on the magazine's Best Sellers in Stores and Most Played in Juke Boxes charts, No. 9 on the Top 100 and No. 16 on the Most Played By Jockeys list. Casey got label credit on "The Fool" and the national hit helped establish him as an in-demand session player, both in Phoenix and L.A. He also started to cut records under his own name: "If I Told You (Wouldn't Know It All By Myself)", "Willa Mae" (featuring Eddie Cochran on rhythm guitar), "A Fool's Blues", "Guitar Man" (featuring Hazlewood on vocals), "(Got The) Teen-Age Blues" and "The Stinger". None of these were hits, but the original records would cost you a pretty penny to collect today. They're all excellent rockabilly numbers or rock instrumentals. Casey played on Jody Reynolds' "Endless Sleep", which got up to No. 5 in 1958, and on Phoenix crooner Donnie Owens' "Need You", which reached No. 25 later that year. Casey's flaming string-bending highlights some of the most sought-after discs by Phoenix rockabilly artists: Clark's "Modern Romance", Jimmy Dell's "I've Got A Dollar", Jim Murphy's "I'm Gone, Mama", Joe Montgomery's "Planetary Run" and Lonesome Long John Roller's "Long John's Flagpole Rock" (commemorating a wonderfully moronic 1958 stunt in which KHAT radio personality Roller spent a world's record 211 days and 23 hours sitting in a Ford Fairlane perched on a flagpole at the old Read Mullen Ford car dealership on Van Buren Street in downtown Phoenix). He played piano on Don Cole's "Snake Eyed Mama". Casey also often is associated with another local guitarist, Duane Eddy. Eddy replaced Casey in the Sunset Riders after Casey tasted national success with "The Fool". Eddy's fame would eclipse Casey's. Eddy is the best-selling instrumentalist of all time and had a string of 27 charted hits from 1958 to 1964 (not counting his 1986 comeback remake of "Peter Gunn" with the Art of Noise). So far he is the only Phoenix artist in the Rock and Roll Hall of Fame and Museum. Casey wrote the guitar-instrumental classic "Ramrod", which was a Top 30 hit for Eddy in 1958. He also co-wrote with Eddy the No. 9 hit "Forty Miles Of Bad Road" in 1959. He toured with Eddy in England and South Africa in 1963. Eddy remembered Casey Wednesday in a telephone interview with Plugged In: 'He was basically Lee's (Hazlewood) musical director. Besides being very close friends, they were drinking buddies and would travel together. Al did a lot of sessions in L.A. He was one of the 'A' players there for a couple of years. He worked the Elvis Presley (TV comeback) special in '68. Elvis liked the look of the guitar Al was playing and borrowed it from him. That red guitar.' Casey also had a great sense of humor, Eddy said. In 1962, the Al Casey Combo had two minor national hits with "Cookin'" (No. 92) and "Jivin' Around" (No. 71). 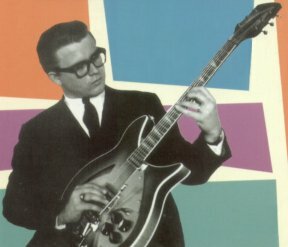 Casey's guitar prowess lent itself perfectly to the surf guitar sound and in 1963 he delivered a mid-chart hit with the surf novelty "Surfin' Hootenanny" (No. 48). His reverb-splashed album of the same title on Stacy Records has a cult following among surf-music fans and is available on CD. Because of his huge contribution to Phoenix music, Casey was among the earliest artists inducted into the Arizona Music and Entertainment Hall of Fame.